All transactions are safe and secure with a reliable history in online purchasing behind each of our associates. Buy the Smiling is My Favorite t-shirt to own Elf clothing and merchandise. Is smiling your favorite? It was Buddy's until his boss convinced him that work should be his new favorite. He took it to the extreme though, creating a mind blowing Christmas display that resembled Santa's workshop in his new employer's toy department. His creation featured glowing Lite Brite signs, a massive Lego city and hundreds of intricate paper snowflakes. If this would put a smile on your face like it did mine then so will this Buddy the Elf t-shirt. For more merchandise like Elf wigs and movie costumes, be sure to check out the rest of the gallery. You will be smiling in no time. 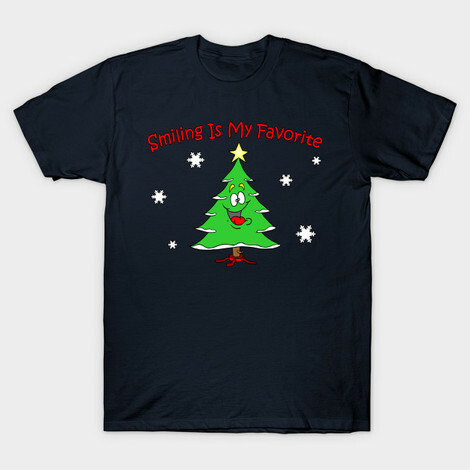 In addition to the Smiling is My Favorite tee above, browse the Elf Clothing Gallery for more apparel like men's and women's clothes, kids shirts or hoodies.